Ok, so, I'd like to introduce you to my new favorite person, Joanne Pasold. Well, wait...actually, I've never met her... lemme 'splain.. Her husband, Ray, works with my brother, Tom, in landscaping. Joanne once made an apple cake to give to all the guys on the tree crew, and they all loved it so much, it was gone in no time. My brother told Joanne of my cooking website and suggested that maybe she might like to share the recipe with me. Well, not only did she share the recipe, but she baked me the cake to go with it! Isn't that awesome? And can I just tell you how yummy it was? 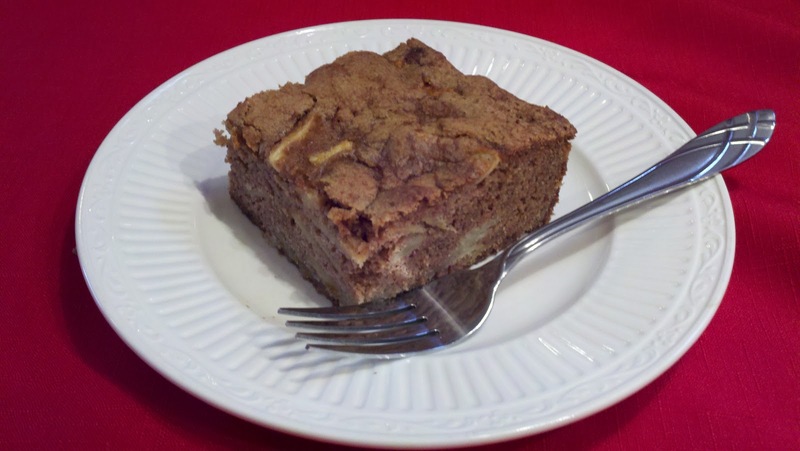 It's kind of like a cross between a spice cake and an apple cake. Dense and rich with cinnamon, but moist and sweet from the apples. SO good! So, Thank you, Joanne, for the recipe and seriously OMG Thank You for the cake!!! Grease and flour (or spray with baking spray) a Bundt pan or a 9x13 baking dish. Set aside. In a large bowl, beat butter and sugar until fluffy. Beat in eggs, one at a time. In a medium bowl, combine flour, baking soda, salt, and cinnamon. Add the flour mixture slowly to the batter. Stir in apple (and nuts, if using). Bake for 50-60 minutes, or until an inserted toothpick comes out clean. Cool 10-15 minutes before serving. If you're using a nonstick spray, be sure to use one that is specifically for baking. In other words, choose a spray that has flour in it. Regular cooking oil spray such as Pam isn't always as reliable for cakes. Always use pure vanilla extract and NEVER imitation vanilla flavoring. Yes, I know the imitation is much cheaper, but it has a noticeably different taste and it's just not as good. If using a Bundt pan, why not drizzle a little caramel sauce over the top and just let it ooze down the sides? Sounds like Heaven to me! If not, I'd probably just dust it with a little powdered sugar. Yum.